R20+5 is the expanded edition of the R20 artbook that was released in 2008. The book is now 432 pages. They have added 96 pages since R20. Majority of the content remains the same. There are very slight layout changes. 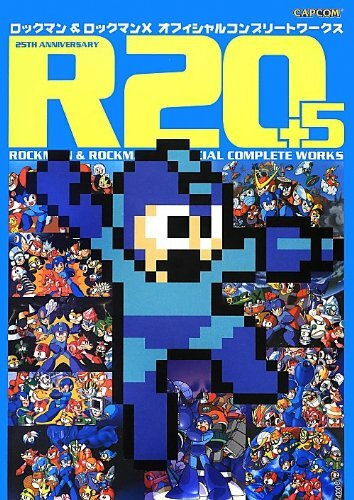 The additional stuff in this book are the 25th anniversary illustrations, art from Rockman 9 & 10, other miscellaneous art such as gaming cards, and interviews with the illustrators Tatsuya Yoshikawa, Haruki Suetsugu, Hideki Ishikawa, Ryuji Higurashi, Keisuke Mizuno, Kenta Saito and Yuri Kataiwa. I've already reviewed the earlier edition so I don't want to repeat much. The book is thick and packed with lots of great art. Udon has also released the English translated edition called MM25: Mega Man & Mega Man X Official Complete Works. Should you get the new book if you have the earlier book? Depends on whether you want all the art from the game series, especially Rockman 9 and 10. The new edition is thicker.